Fort Vancouver Mobile - Sub Rosa: New audio description project underway! While we continue to make updates and upgrades to Fort Vancouver Mobile (catching up with the backlog of production pieces just ready for implementation), we've also started a new project with the National Park Service to improve audio description (aural captioning for the visually impaired). Here is the press release about the project, which is being funded by the federal agency. A team of UH Mānoa researchers has received a $278,300 National Park Service grant for the development of new technologies to provide dynamic experiences for visually impaired visitors of national parks. 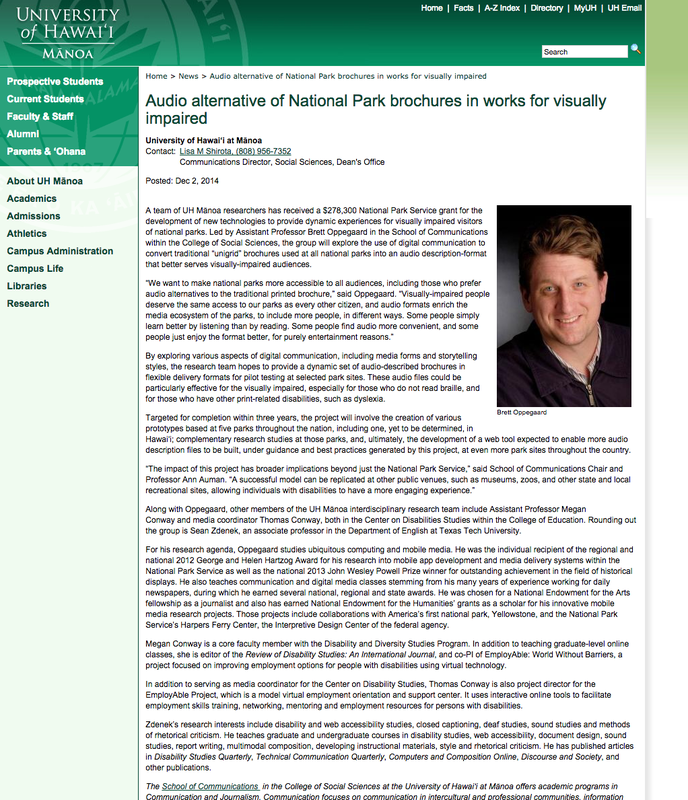 Led by Assistant Professor Brett Oppegaard in the School of Communications within the College of Social Sciences, the group will explore the use of digital communication to convert traditional “unigrid” brochures used at all national parks into an audio description-format that better serves visually-impaired audiences. By exploring various aspects of digital communication, including media forms and storytelling styles, the research team hopes to provide a dynamic set of audio-described brochures in flexible delivery formats for pilot testing at selected park sites. These audio files could be particularly effective for the visually impaired, especially for those who do not read braille, and for those who have other print-related disabilities, such as dyslexia. Targeted for completion within three years, the project will involve the creation of various prototypes based at five parks throughout the nation, including one, yet to be determined, in Hawaiʻi; complementary research studies at those parks, and, ultimately, the development of a web tool expected to enable more audio description files to be built, under guidance and best practices generated by this project, at even more park sites throughout the country. Along with Oppegaard, other members of the UH Mānoa interdisciplinary research team include Assistant Professor Megan Conway and media coordinator Thomas Conway, both in the Center on Disabilities Studies within the College of Education. 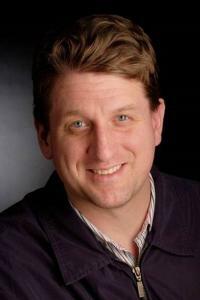 Rounding out the group is Sean Zdenek, an associate professor in the Department of English at Texas Tech University. For his research agenda, Oppegaard studies ubiquitous computing and mobile media. He was the individual recipient of the regional and national 2012 George and Helen Hartzog Award for his research into mobile app development and media delivery systems within the National Park Service as well as the national 2013 John Wesley Powell Prize winner for outstanding achievement in the field of historical displays. He also teaches communication and digital media classes stemming from his many years of experience working for daily newspapers, during which he earned several national, regional and state awards. He was chosen for a National Endowment for the Arts fellowship as a journalist and also has earned National Endowment for the Humanities’ grants as a scholar for his innovative mobile media research projects. Those projects include collaborations with America’s first national park, Yellowstone, and the National Park Service’s Harpers Ferry Center, the Interpretive Design Center of the federal agency. Megan Conway is a core faculty member with the Disability and Diversity Studies Program. In addition to teaching graduate-level online classes, she is editor of the Review of Disability Studies: An International Journal, and co-PI of EmployAble: World Without Barriers, a project focused on improving employment options for people with disabilities using virtual technology. In addition to serving as media coordinator for the Center on Disability Studies, Thomas Conway is also project director for the EmployAble Project, which is a model virtual employment orientation and support center. It uses interactive online tools to facilitate employment skills training, networking, mentoring and employment resources for persons with disabilities. Zdenek’s research interests include disability and web accessibility studies, closed captioning, deaf studies, sound studies and methods of rhetorical criticism. He teaches graduate and undergraduate courses in disability studies, web accessibility, document design, sound studies, report writing, multimodal composition, developing instructional materials, style and rhetorical criticism. He has published articles in Disability Studies Quarterly, Technical Communication Quarterly, Computers and Composition Online, Discourse and Society, and other publications. The School of Communications in the College of Social Sciences at the University of Hawai‘i at Mānoa offers academic programs in Communication and Journalism. Communication focuses on communication in intercultural and professional communities, information and communication technologies (ICTs) and policy, and the media arts. Journalism is professionally oriented and develops critical thinking skills and ability to gather, analyze, and organize information, and to communicate it clearly and responsibly through print, broadcast, and online media. The College of Social Sciences (CSS) at the University of Hawai‘i at Mānoa is engaged in a broad range of research endeavors that address fundamental questions about human behavior and the workings of local, national and international political, social, economic and cultural institutions. Its vibrant student-centered academic climate supports outstanding scholarship through internships, and active and service learning approaches to teaching that prepare students for the life-long pursuit of knowledge. While we have not chosen the specific sites yet for the prototyping (or even discussed them much), I'm intrigued by the possibilities of adding audio description to the Fort Vancouver Mobile project. We'll see what the rest of the team thinks about that idea, and I'll keep you posted!